Their sport has a funny name and has a rep as an old person’s sport, but players young and old at Cape Coral Wellness Center aren’t letting that restrain their enthusiasm for Pickleball. 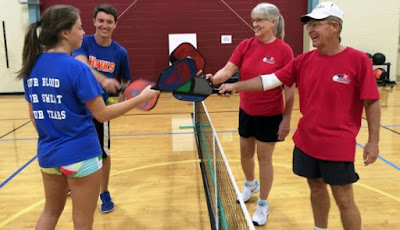 Playing on a regular basis in the center’s gym, they could very well put Cape Coral on the USA Pickleball Association’s map of places to play in Florida. There are 276 locations in Florida with an estimated 18,254 players, according to the association, which is a nonprofit based in Surprise, Ariz. The Wellness Center began making time for Pickleball about six months ago, according to wellness center spokeswoman Kathleen Velez. Player Mike Welter asked for the program and after checking out the costs it was decided to make time and equipment available.